Mounts to roll bar (ROPS). 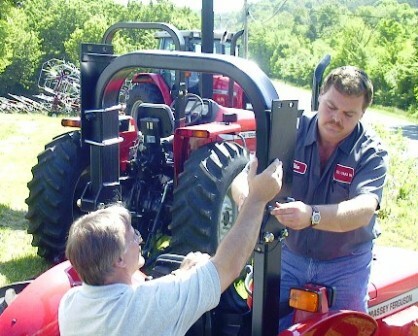 Fits all popular tractors with roll bars. We have sold these high quality canopy / sun shades over twenty five years. They are indeed the very best canopies I ever seen anywhere and are manufactured in Tennessee for us by a wonderful family owned and operated small business. 'Highest Quality Possible' is their hallmark. Steve Carver, 53 years in business. 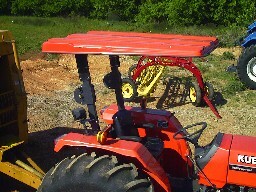 includes fiberglass canopy top, steel frame and steel bracket, mounting hardware. Usually ships same day as ordered. Delivery in the mainland USA 5-7 business days. Order six or more kits and earn 8% discount. Shipping cost to a business location east of the Mississippi usually runs approximately $160. Shipping cost to a private address east of the Mississippi usually runs approximately $210. We will be happy to get firm transport cost for you before offering delivered price. Mounting: All parts included in the kit. Include your complete name, street address with zip code, Tractor mfg. and model, color and series of canopy.